For more MBX-12 techniques, visit this page. Our health and happiness in life is enriched when we are capable of relaxing, of letting go stressors, of being in the moment with the natural self, and of accepting ourselves as we are. MBX 8: Lotus Posture helps you unfold your body, stretch the shrunk torso after a long day’s work, from toes to the head in one backward arching posture with a set of deep breathing. At one stretching, you provide ample spaces for your hard-working stressed-out organs, to breathe, to swim, to play, to love you. Physiologically, Lotus Posture stimulates the senses at the bottom of the feet, which surge through the legs spreading up to the lower torso and then into the chest. When done right, at full inhalation and backward arching, you may feel your torso filled with fresh air yet empty, allowing your body to repose at momentary stillness. An invigorating moment. 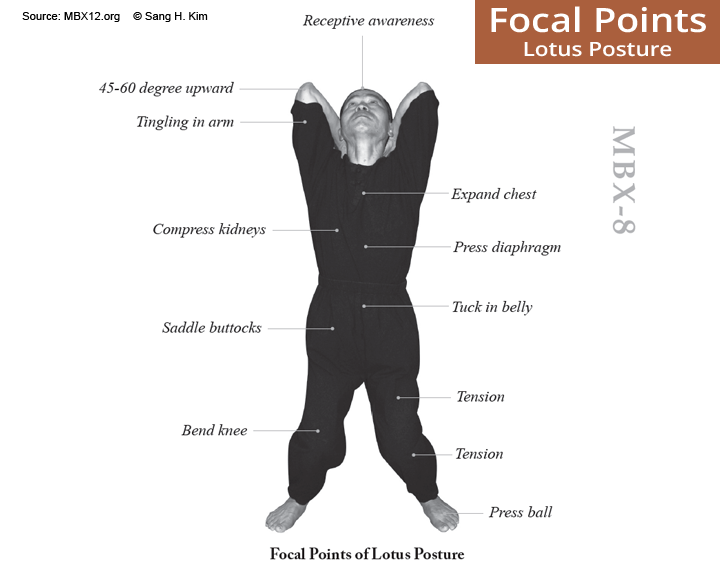 MBX 8: Lotus Posture refreshes the body and mind through inducing calming effects by activating the Kidney Meridian and reducing stress responses of the hypothalamic-pituitary-adrenal (HPA) axis, one of the major stress coping mechanisms in human body. From natural stance, take a deep breath. Exhaling, bend your knees lowering your body, and raise your arms with the palms facing you. Place them next to your head (1). Make fists, place them beside your neck, and rest your head between them (1b-c). Inhaling, gently tilt your head back, raising your elbows like blossoming lotus petals opening. Lower your knees further to feel the stretch in the torso. After 5-10 seconds, exhaling, return to natural stance. Take a deep breath and repeat. You may repeat this process 2-3 times consecutively. The kidney meridian starts from the bottom of the foot, innervating through the inner leg toward the groin and up the front of the pelvis, and ending at the upper central region of the chest. 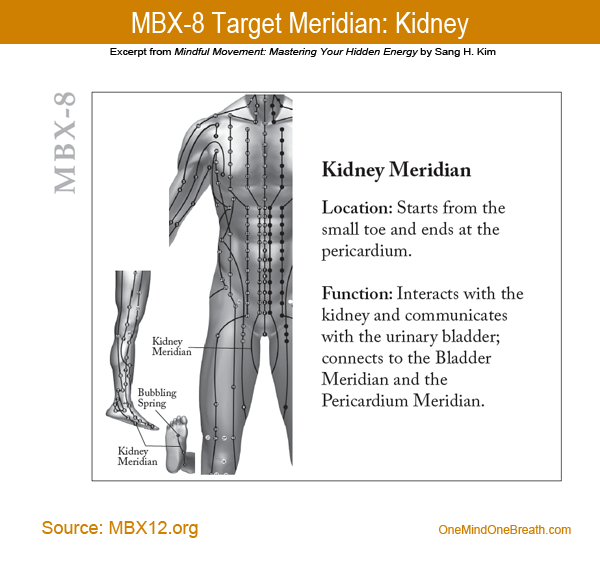 The Kidney Meridian is known as the most influential and mythical energy channel for stamina and reproductive function in humans. The Kidney Meridian, one of the most influential energy channels for developing stamina and reproductive function in humans, has invigorating yet relaxing effects on the body when activated. The first point of the kidney meridian, on the bottom of the feet, is called the Bubbling Spring, and is known as a gate for the root energy of the mother Earth entering into the body, surging through the legs and lower belly, through the kidneys and throughout the body, revitalizing the life force. 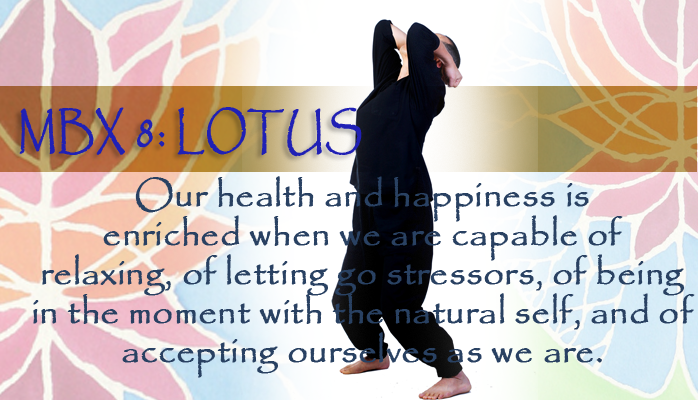 Lotus posture consists of two simple movements: natural stance and Head Rest (3). Each repetition takes only 10 seconds. As you become more comfortable, stretch the duration to 15 seconds. After three months of practice, you may try 20 seconds, which means three times per minute. 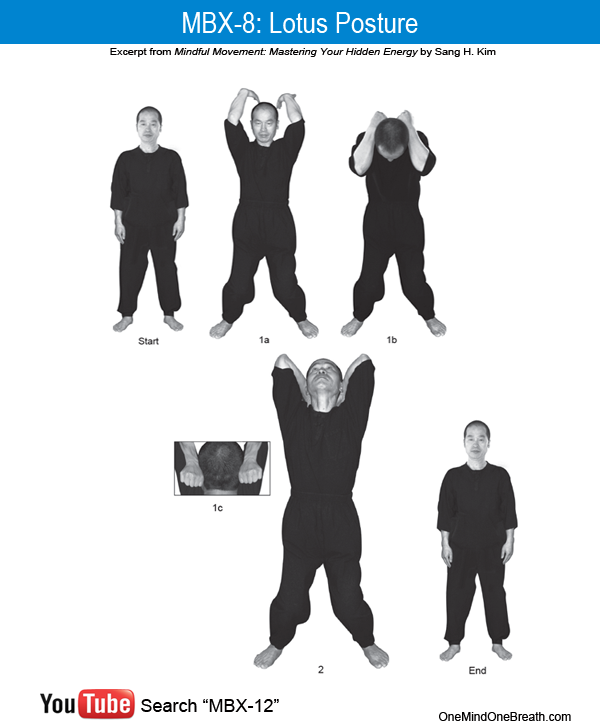 Key Points for Practicing MBX 8: Lotus Posture: Plant your feet firmly and let the body unfold progressively upward in arching, starting from the toes, heels, ankles, shins, thighs, abdominal and chest muscles, neck, face, and finally the top of the head. If the feet anchor your body into the ground, the top of the head releases the surging energy, connecting them all. For Advanced Practitioners: Be aware of the different effects of the two movement types: forward and backward bending. The forward bending movement gives more space to the kidneys in the back of the body while compressing the other organs. On the other hand, the backward arching gently stretches the muscles and nerves along the entire frontal side of the body, while stimulating the kidneys by compression. Gentle elongation and contraction of the muscles around the organs induces soothing effects, improving heart rate variability and blood pressure. Make sure to listen to your body. If you feel dizzy, gently kneel or sit and rest until you feel ready to resume practice. If you have discomfort in your neck or spine, reduce the angle of your neck by tilting your head back less. This entry was posted in MBX-12 Workshop, MBX12, Mindful Movement and tagged Blood Pressure, Breathing Methods, Calming Effect, Chi, Equilibrium, Heart Rate Variability, How to Boost Energy, Kidney Meridian, MBX-8, Qi, Refreshing, Relaxation, Sang H. Kim. Bookmark the permalink. Thinking of you and your family. I hope that all is well. Thank you so much for your kind thoughts! I will return on April 29.